Hill College President Sheryl Smith Kappus and SHSU's Provost and Vice President for Academic Affairs David Payne sign the joint agreement on July 7. Joint admission, reverse transfer and web-based articulation agreements are the three features of agreements recently signed by Sam Houston State University and two other colleges. 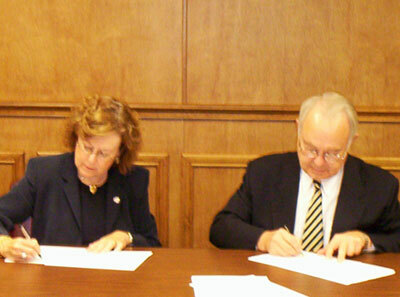 Provost and Vice President for Academic Affairs David Payne and Lee College President Martha Ellis, signed an agreement June 30 in Baytown. The same set of agreements was signed by Payne and Hill College President Sheryl Smith Kappus July 7 in Hillsboro. Joint admission allows students to attend classes at either college and SHSU simultaneously, while reverse transfer allows students to transfer course work from SHSU back to either college to complete their associate degree. The online articulation agreements allow Lee and Hill students to complete course work with the knowledge that they will be able to transfer the credit to SHSU and apply it to over 40 majors. The agreements also allow joint admission students to access their SHSU transcripts and generate trial degree plans via the Internet, as well as provide students with the SHSU Bearkat OneCard, grant access to SHSU sports events, provide an SHSU e-mail account and sufficient disk space on SHSU’s Internet server and library and computer lab access. Similar agreements have been signed with North Harris, Montgomery, Blinn, Angelina, Navarro and Houston community colleges. Diane Neudorf and William Lutterschmidt, assistant and associate professors respectively in the biological sciences department, will host the 2nd annual Research Experiences for Undergraduates in Field Biology Poster Conference on Thursday (July 21). The poster presentations will be on display in the Lowman Student Center from 1:30-3:30 p.m. and will showcase the research accomplishments of the six students who participated in SHSU’s National Science Foundation program. This poster conference is one of the academic activities outlined in the National Science Foundation program which helps six students gain research experience over the summer, according to Lutterschmidt. Neudorf and Lutterschmidt received the $151,000 NSF grant to help promote undergraduate research within the biological sciences. Students across the country compete for six summer positions each summer, and those undergraduate students selected to participate in the program gain confidence in their abilities as scientists through planning, conducting and being responsible for their own research project under the guidance of research faculty, Lutterschmidt said. "This program helps foster an interest and enthusiasm for pursuing graduate studies in biology and ultimately future careers in science and research," he said. For more information on the NSF program, visit www.shsu.edu/reu or contact Lutterschmidt at lutterschmidt@shsu.edu or 936.294.1556. Lesley Rakowitz, with agricultural sciences professor Stanley Kelley, accepts the NACTA Graduate Student Teaching award on June 17. Rakowitz was one of 12 to receive the North American College and Teachers of Agriculture’s Graduate Student Teaching award June 17 at its 51st annual conference at Ohio State University Agricultural Technical Institute in Wooster, Ohio. The national award is given based on nominations by faculty members and supporting documentation, including letters from faculty members and students whom she has taught, and recipients are selected by a national committee, according to agricultural sciences professor Stanley Kelley. In addition, Rakowitz received a lot of very positive student and colleague comments, with her teacher evaluations stating such things as she “makes learning fun,” and is a “good lecturer, knowledgeable, and very enthusiastic,” Kelley said. “ This past semester, Lesley stepped in to teach both the lecture and lab for our advanced level meat science course (AGR 376),” one nomination letter said. “Her overall student evaluations ranked in the upper sixes (out of a maximum score of seven). Rakowitz, who received her bachelor’s degree from Texas A&M University, anticipates receiving her master’s degree from SHSU this August. In addition, Rakowitz has been hired as a lecturer at SHSU in the fall, which she will do while returning to Texas A&M to work on her doctorate. The Student Advising and Mentoring Center will host a graduate school informational meeting on July 18. The meeting will be held at noon in the SAM Center, in Academic Building 4 Room 213. The program will address a number of questions about the graduate school application process including financial aid, academic requirements and the graduate school time line. For more information contact Gerri at stdgaj14@shsu.edu or call 294-4444.